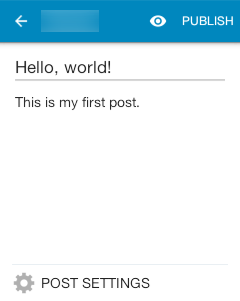 The WordPress Android app lets you handle your website whenever you wish, wherever you are. Simply login following the instructions and enjoy the advanced operations you can perform on the go. You can keep up with your posts, communicate with your users and never lose touch. Publish blog updates no matter where you are. Check-up on your views and visitors. Learn about them and what they’re all about. Your top posts and most popular stories of the day are just a few clicks away. Catch up with your favorite websites and connect to your online world. Never miss a thing again. Keep up with your website’s activity at all times. Promote its publicity by enhancing your chatting and posts from your location. Jetpack now includes valuable features previously only available to WordPress.com users including customization, traffic, mobile, content, and various performance tools. 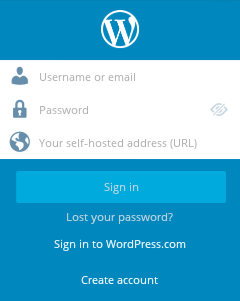 For you to access your WordPress website using the WordPress mobile app, go on the Add Self-Hosted Site in the login screen. Enter your website’s username, password, as well as the URL. If you are also connected to Jetpack, you will have to provide your WordPress.com login information. To manage your website, select the WordPress icon. It will take you to the Android Dashboard, where you can choose the site you want to manage at the top of the menu. To switch sites, click the website title displayed on the top of the list. Through the Android Dashboard you have the ability to add or edit Posts, Pages, Media and Comments. You can also update themes, add an image or video, view stats or go to your website! Just scroll in the menu to view all the options. From the WordPress icon and with your website selected, you can create a post by tapping the Compose button in the bottom right corner of your Android Dashboard. 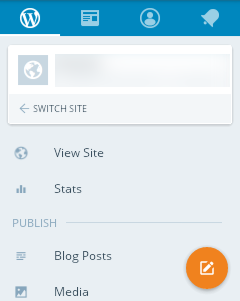 You can edit any post by selecting it from the Blog Posts screen. When writing a post, you can add rich text inline using the buttons just above the keyboard. The default styles include bold, italics, underline, strikethrough, blockquote and hyperlink. You can also toggle to the HTML if you want to add more styles within your code. You can access additional post settings, such as Save Draft, Categories, Featured Image, and more by selecting Post Settings at the bottom of the Post screen. From the WordPress icon and with your website selected, you can create a page by selecting Pages in the Android Dashboard, and tapping the Compose button in the bottom right corner. You can edit each page by selecting it from the Pages screen. 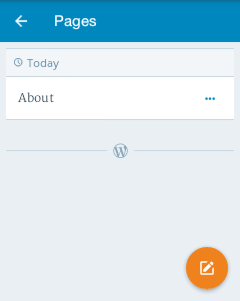 Same with posts, you can style text your pages using the buttons just above the keyboard. With the Android App, you can add images directly from your device or images from your media library. From a Post or Page, select the image icon. There you will have several options, including uploading it from the device, choosing existing media or even creating a new gallery. The Capture feature will activate your device’s camera and the Select … from gallery option will allow you to choose media already captured. 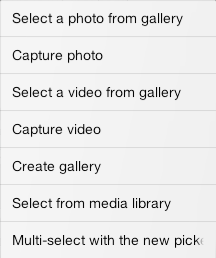 You can also select existing media from your media library or create a gallery of media. 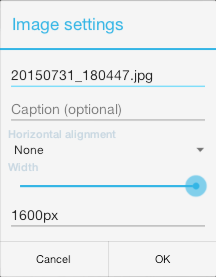 Once an image has fully uploaded, tap the image to bring up the Image Settings. For troubleshooting help and more information on using the WordPress Android app, please visit the detailed official FAQ.